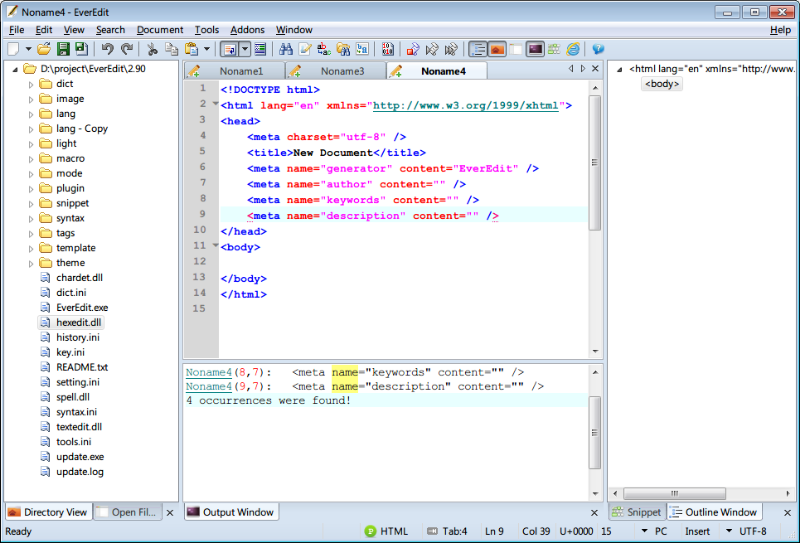 EverEdit is a fast, lightweight, skinnable and extendable editor. While it can serve as a Notepad replacement, it also offers many powerful features for Web page authors and programmers including snippet support, markdown support with instant preview, syntax highlighting for many languages, full Emmet Support aka Zen Coding, multiple selection (smart rename), and more. The program includes a hex editor and easily edits large files (1 Gig+). Note: v2.9.0.2074 is (presently) the last freeware version, which is no longer hosted by the authors. We are linking to majorgeeks for the 32-bit version and archive.org for the 64-bit version (thanks DzejPy and lintalist). Note by the author: "I will not add new features for 2.9xx., but I will continue fix the bugs for this version." Download links do not work... Error 404. Can't find what you are looking for? This list shows entries with Programming - Hex Editors as a supplementary function. You can view more entries with Programming - Hex Editors as a primary function.